Yesterday, February 12, 2019, patrol officers from the New Castle County Division of Police were dispatched to the area of Chestnut Hill Road and Harmony Road for reports of multiple vehicles being stolen. When the officers arrived, they learned that a total of five vehicles were stolen. One vehicle was stolen the day before and four more vehicles were taken during the morning hours, according to police. During each incident, the stolen vehicle was unlocked and running in front of their homes. Witness statements lead to descriptions of multiple suspects and the vehicle that they were driving. The suspect vehicle was described as a gray Chevrolet Suburban. The suspect(s) were observed exiting this gray SUV, then entering the idling cars and driving off, said police. Officers from the New Castle County Division of Police Mobile Enforcement Team located a vehicle matching the description and were able to stop the vehicle. Officials said Detectives from the New Castle County Division of Police the assumed the investigation which lead to the arrest of 4 four suspects. Four of the five stolen vehicles were also recovered. 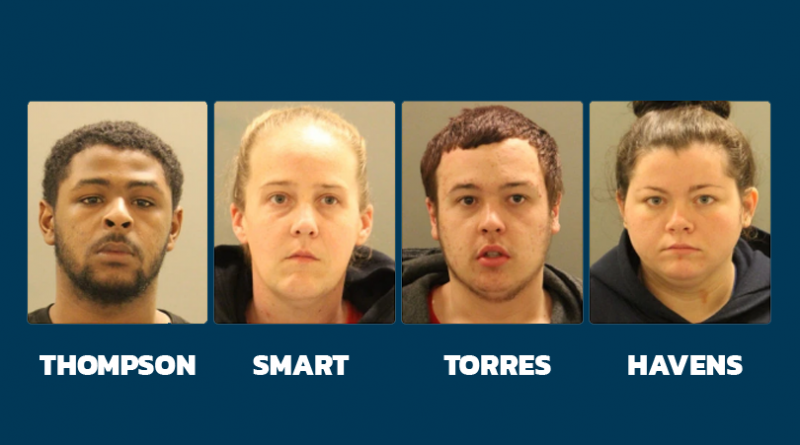 Arrested were: 19-year-old, Malik Thompson of Newark, 30-year-old, Mary Smart of Newark, 20-year-old Frank Torres of Bear, and 22-year-old Christina Havens of Middletown. Malik Thompson was charged with: six counts of Felony Theft of a Motor Vehicle, two counts of felony Burglary 3rd, five counts of felony Conspiracy 2nd, and one count of misdemeanor theft. He was arraigned by Justice of the Peace Court 11 and held in lieu of $29,000 cash bail. Mary Smart was charged with: five counts of Felony Theft of a Motor Vehicle, five counts of felony Conspiracy 2nd, and one count of misdemeanor theft. She was arraigned by Justice of the Peace Court 11 and held in lieu of $27,000 secured bail. Frank Torres was charged with: five counts of Felony Theft of a Motor Vehicle, five counts of felony Conspiracy 2nd, and one count of misdemeanor theft. He was arraigned by Justice of the Peace Court 11 and released on $21,000 unsecured bail. Christina Havens was charged with: five counts of Felony Theft of a Motor Vehicle, five counts of felony Conspiracy 2nd, and one count of misdemeanor theft. She was arraigned by Justice of the Peace Court 11 and released on her own recognizance. Newark Police are also investigating an alleged auto theft involving a gray Chevrolet Suburban. Officials have not said if the two stories are related.